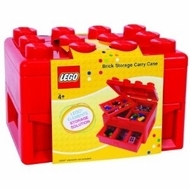 Lego Deluxe Brick and Minifigure Storage Carrying Case with Pull out Drawer - The perfect gift for that special Lego collector, this convenient, sturdy carrying case holds all your special LEGO. Officially licensed and shaped like a giant Lego Brick, you will no longer lose your LEGO in a giant bulk bucket. With a deluxe storage drawer and removable bins, this case is the ultimate in storage for LEGO. Perfect for the Lego Master on the Go!